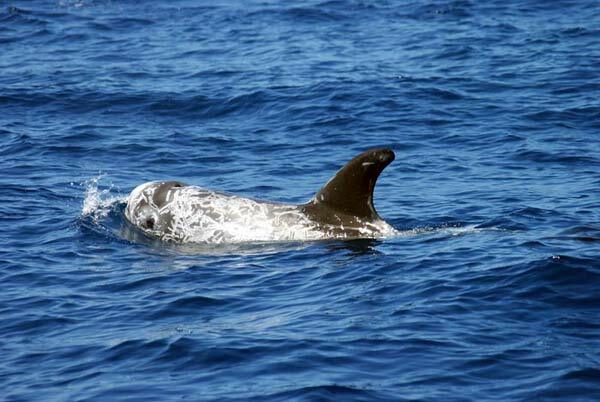 The Risso's dolphin is the fifth largest member of the family Delphinidae. The common name comes from Antoine Risso, a French-Italian naturalist, who described the species first in 1812. Risso’s dolphins are unusual looking: their anterior body is extremely robust, they are blunt-headed without a distinct beak. They are easily identified at sea by their very tall dorsal fin and their unique coloration and scarring. Adults are greyish in colour, typically covered with white scratches, spots and blotches. They can reach up to 4 metres in length. Their scars are presumably caused by intra-species interactions. They are typically gregarious, mostly travelling in groups of 10-50 individuals, with the largest groups observed estimated to contain over 4,000 animals. They frequently travel with other cetacean species, such as grey whales. Risso’s dolphins usually avoid boats and human contact, except for one individual called “Pelorus Jack” who has been escorting boats into Admiralty Bay in New Zealand for over 20 years now. Limited behavioural observations suggest that they feed predominantly on squid and hunt at night. Risso’s dolphins are widely distributed in deep oceanic and continental slope waters, from the tropics to the temperate regions of both hemispheres. They are locally abundant along the west coast of Ireland and around the Outer Hebrides, especially where the continental shelf is narrow and deep water is found close to the coast. No estimate of population numbers inside the ASCOBANS area is available. Risso’s dolphins have been recorded stealing fish from long lines. These interactions with fisheries often result in accidental bycatch. Incidental entanglement is also known to occur with other fishing gear around the world. Risso’s dolphins off the west coast of Scotland have been known to change their behaviour in the presence of passing vessels, indicating that they feel disturbed and threatened by underwater noise and/or collisions with vessels. Small numbers of animals have been killed in deliberate whaling operations, e.g. in Sri Lanka. Single individuals have been held in aquaria in Japan and the United States. Northern East Atlantic None N/A Project Report: Review of Trend Analyses in the AS [more] There is no estimated population size of Risso's dolphins from the SCANS-II (2005) and CODA (2007) surveys. Essentially nothing is known about the population structure of this species (http://www.wdcs.org/submissions_bin/Rissos_Conservation_Plan.pdf). Central East Atlantic None N/A Project Report: Review of Trend Analyses in the AS [more] There is no estimated population size of Risso's dolphins from the SCANS-II (2005) and CODA (2007) surveys. Essentially nothing is known about the population structure of this species (http://www.wdcs.org/submissions_bin/Rissos_Conservation_Plan.pdf). Bay of Biscay None N/A Project Report: Review of Trend Analyses in the AS [more] There is no estimated population size of Risso's dolphins from the SCANS-II (2005) and CODA (2007) surveys. Essentially nothing is known about the population structure of this species (http://www.wdcs.org/submissions_bin/Rissos_Conservation_Plan.pdf). Northern North Sea None N/A Project Report: Review of Trend Analyses in the AS [more] There is no estimated population size of Risso's dolphins from the SCANS-II (2005) and CODA (2007) surveys. Essentially nothing is known about the population structure of this species (http://www.wdcs.org/submissions_bin/Rissos_Conservation_Plan.pdf).